Cultural capital of the German Enlightenment, first democratic capital of Germany, and cradle of the Bauhaus movement, Weimar has a lot to be proud of. Yet this modest town is not the country's most beautiful one, nor does it have any breathtaking sight. 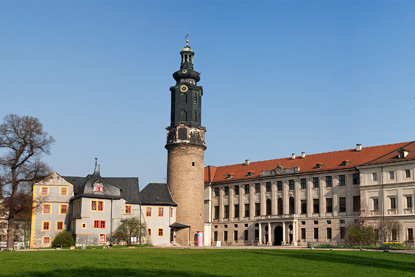 Weimar's attraction is more intellectual, a sort of pilgrimage site for the German nation in the footsteps of Goethe, Schiller and others. Generally hailed as Germany's greatest writer and poet, Johann Wolfgang von Goethe spent most of his working life in Weimar, from 1775 until his death in 1832. His principal benefactors and employer, Grand Duke Carl August of Saxe-Weimar-Eisenach, did all he could to keep this figurehead of the German Enlightenment in Weimar. In 1776, Goethe first received as a gift a house in Park an der Ilm, a park spreading on both sides of the Ilm River on the eastern edge of town. Known today as Goethe's Garden House, it became his main residence from 1776 to 1782. A few hundreds metres south-east of there is the Roman House, the summer residence of Grand Duke Carl August. The whole park is listed by the UNESCO and an exact replica of Goethe's house was built in 1999 for tourists to protect the original one. In 1792 the duke presented another house to Goethe, where he was to spent the rest of his long life and write many of his greatest works. 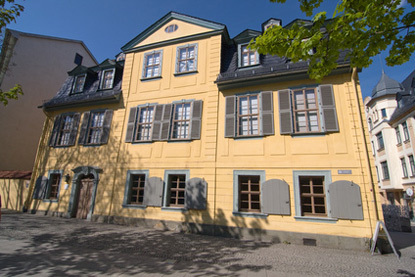 Now known simply as Goethe's House, it is Weimar's most popular attraction and houses the Goethe National Museum. Schiller's House is located on Schillerstraße, close to the town hall. He spent the last six years of his life here, from 1799 to 1805, and his deathbed is still visible on the second floor. Romantic composer and virtuoso pianist Franz Liszt also lived in the Park an der Ilm, in the so-called Liszt's House. He occupied it in 1848, then again from 1869 to 1886. It is here that he composed his Faust Symphony and Hungarian Rhapsody. 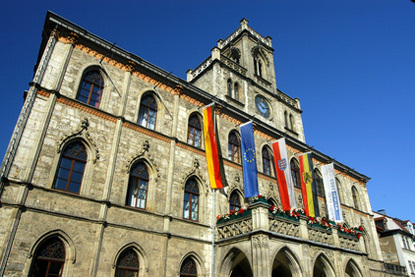 The enormous Stadtschloss (City Palace), extending to the north of the market square, was the seat of the Grand Dukes of Saxe-Weimar until 1918. It was converted into an art museum in 1923, which boasts paintings by Cranach, Dürer and Tischbein, and sculptures by Auguste Rodin. 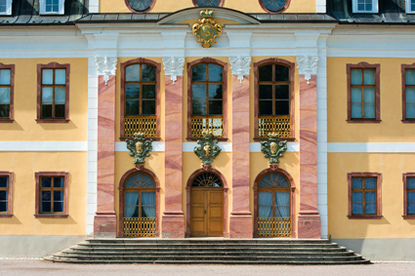 Weimar's most attractive building is surely the yellow-painted Belvedere Palace, Grand Duke Carl August's extensive Rococo-style hunting lodge. It is located 3 km south from the Roman House (or 4 km from the market square) straight along Belvedere Allee. 3 km north-east of the market square is another ducal residence inside Tiefurt Park. It is accessible on foot using the Karolinenpromenade across the forest from behind the Stadtschloss. Belgian architect Henry van de Velde designed several Art Nouveau buildings in Weimar, such as the Haus unter den Hohen Pappeln ("house under the high poplar trees"), and the entrance of the Nietsche Archive. Walter Gropius founded the Bauhaus School in Weimar in 1919, before moving to Dessau in 1925, then to Berlin in 1932. Anyone interested in this architectural and artistic style should visit the Bauhaus Museum. 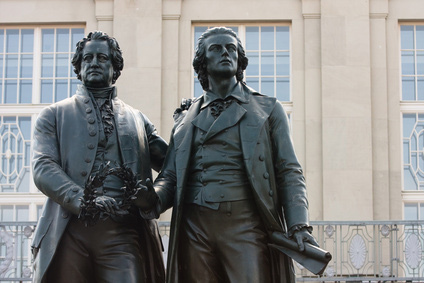 Statues of Goethe & Schiller in front of the German National Theatre, Weimar.